The TD said she had a termination at the age of 23. 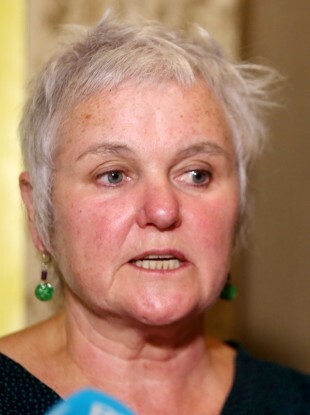 DEPUTY BRID SMITH has become the first Irish TD to speak publicly about having an abortion. The Solidary-People Before Profit TD spoke about the experience, which took place when she was around 23, during a recording of the Irish Times’ The Women’s Podcast live on the Wanderlust stage at the Body & Soul Festival last weekend. “I just didn’t want to be pregnant. I really felt it. I just didn’t want to be pregnant,” said Smith of her reason behind the decision. I think it was around 1985, so I was a very young woman. It was about two years after the referendum [where the Eighth Amendment was inserted into the Constitution]. So I’ve never felt ashamed about that abortion, that’s what I chose to do and I was supported by my family and friends and everything, but I’ve never spoken about it. The theme of the podcast event was ‘the walk (and talk) of shame’ and Smith said that she thought “maybe there was an element of shame that I couldn’t identify” about her abortion. She said her friends and family were “very supportive”. “I think the country tried to make women feel ashamed of that,” she said of women having abortions. In order to have the termination, she travelled to the UK by boat – to keep the cost down – and stayed with the brother of a friend in Liverpool. Her sisters picked her up from the ferry when she arrived home, and they went to the early house in the Long Hall and “had a few scoops” before they went to bed. “The more I talk to people about this the more I realise it’s part of normal life,” said Smith. “I am so ashamed of this country, the way it treats women and girls,” added Smith in the podcast. The 21-person Oireachtas abortion committee, which is tasked with proposing changes to Ireland’s legislation surrounding abortion following on from the Citizens’ Assembly recommendations, met for the first time on 21 June. Its chair is Fine Gael Senator Catherine Noone. The Citizens Assembly recommended that the Oireachtas should legislate for abortion and allow abortion without restriction in Ireland. Email “Brid Smith: 'I had an abortion... I've never felt ashamed about it'”. Feedback on “Brid Smith: 'I had an abortion... I've never felt ashamed about it'”.